“Sick and tired,” indeed. Everyone in the Country is sick and tired of the unmitigated gall, arrogance, and blatant disregard for NCAA Rules routinely demonstrated by the trojans. Of course, that doesn’t seem to stop anyone at usc from acting that way, and from continuing to flaunt those rules. 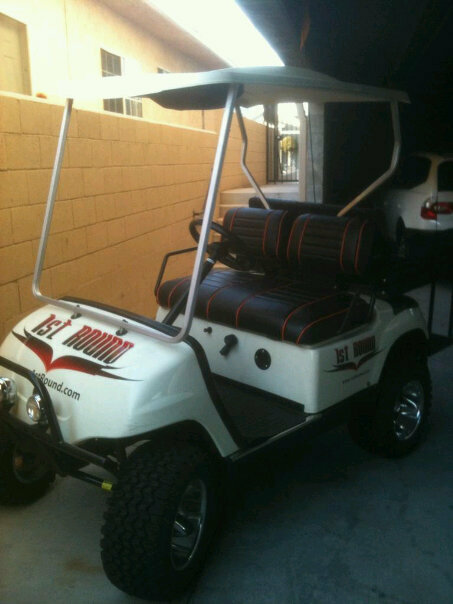 You already know that trojan Running Back Dillon Baxter was suspended for taking a ride on campus with Teague Egan, a registered NFL Agent, in a golf cart clearly labelled with the logo of the Agency, “1st Round Enterprises.” And despite the logo, Baxter denied knowing that Egan was an Agent. But what you might NOT know is that Egan had been previously warned by usc that he isn’t allowed to transport any players. So even if you are gullible enough to think that Baxter was clueless about Egan’s NFL ties, it appears that Egan knew that what he was doing could jeopardize sc’s entire Football Program. But being a greedy SCumbag (he’s an enrolled student at sc), he didn’t care about his school’s welfare, only about making money, and keeping himself OFF welfare. On the other hand — We have only USC’S word that Egan had been warned. Maybe that is just the story that usc is spinning, in order to keep their sanction Appeal alive, by avoiding more accusations of “Lack of Institutional Control.” When Egan was questioned, he refused to comment, saying that he and sc were trying to work together to put this all behind them. In other words, he didn’t want to say something that would CONTRADICT sc’s official story. If this is a massive cover-up, using Egan as the SCapegoat, it’s only one facet to the (potential) lies. The spin out of Heritage Hall is that one of sc’s many Compliance Officers saw it go down, and immediately turned them in. That way, it makes sc look more diligent than if some ordinary student dropped the dime. With a giant logo, either scenario is possible. Meanwhile, LAST year, Egan threw some parties downtown, that were attended by SEVERAL usc players, including the likes of Taylor Mays, now fully contracted with the NFL. When a website published photos of all these trojans partying with Egan, sc’s Damage Control Patrol kicked it into high gear to deflect all blame. First, they claimed that Egan wasn’t registered with the NFL (YET), when the parties took place. But just in case that flimsy excuse didn’t fly, they also contend that the players paid the same cover charge as everyone else who attended, including non-player students, in which case, no violation occurred. So we’re supposed to believe that Egan made Taylor Mays — a prospective 1st Round Draft Pick and prospective 1st Round client — actually had to PAY to get into Egan’s party? I’d like to see THAT receipt. Of course, with a cover-up of this magnitude, I’m sure the trojan printing presses could spit out anything they need, including backdated receipts and admission tickets, and, someone could even muster up some hand stamp residue, if necessary. Someone needs to call CSI South Central. If you want to reach out to Dillon Baxter, for putting sc’s entire Football Program on Death Watch, don’t bother trying “DillonBaxter.com,” because that is, appropriately, a Funeral Home. But you could try the field at the upcoming sc-Notre Dame game, because usc expects him to have his eligibility re-instated any day now. All Baxter had to do to make up for his transgression was to donate $5 to Charity. Apparently, $5 is the value of a ride to class at usc. Maybe he could have Egan write an essay for him to hand in. Then afterwards, he could donate $10, and still come out squeaky-clean. Is Reggie Bush listening? Why doesn’t Reggie just donate $300,000 to a Charity — Then sc could let him back on the sidelines. They could even put his jersey back up on display, next to O.J. Simpson’s. Speaking of O.J., Markeith Ambles, the trojan football player who didn’t know that you can’t spell “trojan” without “o.j.” just got kicked off the team. Freshman Ambles, who, when signed by usc, tweeted that he had committed to the “trogans,” was not fit to be a trogan for life. Kiffin won’t say what really happened, only that Ambles is no longer on the team. Could it be that Ambles was already caught with Egan, and had already obtained a verbal agreement for representation? Or maybe Ambles left on his own, when he heard what happens to former trojan grads, like Anthony Davis. The old trojan hero from the 70’s was exposed in the Times yesterday, for owing money to a couple of sc boosters who tried to help him out. Apparently, someone tried to bankroll a Davis autobiography, but the book didn’t sell at all, and is already out of print. Not only that, but Davis is accused of stealing the books, and trying to sell them out of the trunk of his car, without giving any money to the publisher or the investor. The article also implies that Davis had phony Championship Ring replicas made, which he tried to sell to trojan suckers. They didn’t sell either, and once again, Davis stiffed the investors. Add all of this dubious behavior to to the previously-released stories of Davis refusing to sign stuff for children fans, instead demanding a $10 fee for his autograph, which he claimed went to his charitable foundation. Unfortunately for Davis, the managers of the foundation never saw the money. Now put all of this information together, and you can understand why Davis works as a Security Guard, and lives with his Mother in an apartment in Sylmar. I guess his usc education couldn’t land him a better gig than night watchman. But the best part of the article was a quote by a trojan teammate of Davis’ named Marvin Cobb, who said that trojans “have a natural tendency to overestimate who they are.” Ladies and Gentlemen, we have a WINNER… of the Understatement of the Year Award. Never before has a trojan completely grasped the obvious like this. Usc should put that quote on a plaque, and hang it in Heritage Hall. And speaking of Captains of the Obvious, writer Norman Chad published an article that basically called Pete Carroll a total SCumbag who ran out on sc just ahead of sanctions, and called Lane Kiffin a talentless loser, the “Kato Kaelin” of the NCAA, who would be living in someone’s guest house if not for the notoriety of his Assistant Coach father. Chad truly captured the essence of trojan football, and described it in nauseatingly accurate detail. And while usc was dodging nuclear missiles aimed at their heads all week, two different UCLA Bruins received awards this week… in Basketball, of course. All-Time Great Sidney Wicks was inducted into the College Basketball Hall of Fame, and current Great Reeves Nelson was named the Pac-10’s Player of the Week. Wicks couldn’t be more “proven;” Nelson will have to prove himself further, tonight, in Madison Square Garden, when the Bruins take on #7 Villanova. Even Nelson’s toughness will be put to the test against the Big East beasts from Philadelphia. If the Bruins keep it close, it will be considered a good night for a re-emerging UCLA team. Now, speaking of good nights, I will now make your night a little better, with 11 more never-before-seen photos of the UCLA Spirit Squad, many of them featuring girls looking at something to the side, as if there’s a rule-breaking trojan in their peripheral vision. "TROJANS BLAME IT ON ILLNESS AND FA-TEAGUE" was published on November 24th, 2010 and is listed in Blue & Gold News, News from the Dark Side, UCLA/usc/Cheerleader Photos. “There’s a natural tendency among Trojans to overestimate who we are,” says Marvin Cobb, Davis’ longtime friend and former teammate. “It comes with the swagger, the legacy, the tradition you try to live up to. “You can get carried away sometimes.” I guess trojans like being “natural”! Rock On! According to what I read two days ago in 1st Round’s web site, Egan Teague “attended” U$C, which means he is not currently a student. So either the web site is wrong, or somebody at U$C is lying about his being a student there. This is the best website in the universe. I didn’t know about Anthony Davis article/info and now i HAVE to check it out. what a tool. I hated it when fox sports had him on tv with petros talking about football last yr when on mondays they would go to the two schools to talk about the preceding weekends games. i almost threw up listening to him. i did read that washington post article about chetey and lame-0 and the kato quote was the best i’ve heard in a while.